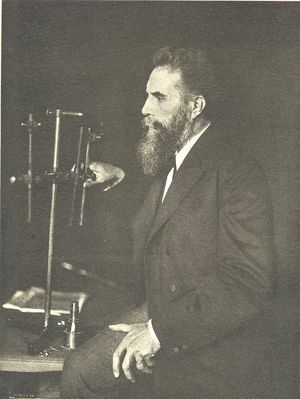 In 1896 Wilhelm Röntgen (the name is often rendered Roentgen in English) discovered something that would prove to be one of the major medical breakthroughs of the twentieth century—the x-ray. If you ever suffered a broken a bone or had a thorough dental exam you have undoubtedly been subjected to an x-ray machine. X-raying is a way of taking pictures of your insides and bones through your clothes and skin. This lessens the need for exploratory surgery and makes diagnosis and treatment of an injury faster and safer. Since Röntgen’s discovery countless lives have been saved by this technology. Röntgen was born on 27 March 1845, in Lennep, Prussia (now Remscheid, Germany). Educated in The Netherlands and Switzerland, Röntgen obtained his doctoral degree in physics at the University of Zurich in 1869. He conducted research and taught at the universities of Strasbourg, Giessen, Wurzburg, and Munich. One of Röntgen’s major interests was cathode rays. In the mid 19th century, scientists found that an electric charge could flow through a vacuum (usually a glass vessel from which almost all the air had been removed) from one conductor, called an electrode, to another. It appeared that radiation emanated from the negatively charged electrode, called the cathode, toward the positively charged electrode, the anode. This was the cathode ray. Scientists discovered that cathode rays could be used to cast shadows and that they could be bent by magnets. 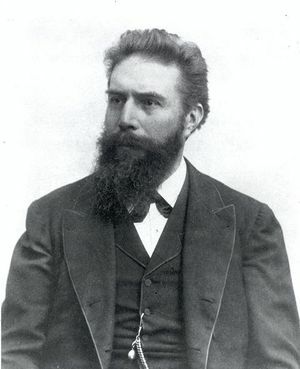 Wilhelm Röntgen was one of the scientists studying cathode rays. One day—the year was 1895—he noticed that when he was producing cathode rays a mineral (barium platinocyanide) elsewhere in his laboratory gave off light. He hypothesized that the cathode rays were somehow producing an invisible radiation that, when it struck that particular mineral, caused it to emit light. He found that this unknown radiation seemed to pass through many materials, such as paper and wood. He found also that it affected photographic film, so that he was able to obtain images of dense materials surrounded by less dense materials, such as bones surrounded by soft tissues. It was this medical application that spurred the development of this new means of making images. It gradually became clear that what was happening was that in a cathode-ray tube, electrons, emitted by the cathode, gained speed and struck the anode, releasing their energy as electromagnetic waves. These waves were similar to light waves, but of a much shorter wavelength. Another thing that gradually became clear was that x-rays often caused damage to living tissue and that it was important to limit exposure to the radiation. Röntgen’s x-ray was a major medical breakthrough. For the first time in human history it gave medical personnel a means of seeing inside the body without having to resort to surgical procedures. The use of x-rays spread quickly around the globe. Röntgen received the Nobel Prize in Physics for his discovery in 1901. Later in life he conducted research in many diverse fields, including elasticity, fluids, and crystals. He passed away on 10 February 1923 in Munich, Germany. This page was last edited on 8 March 2016, at 17:54.